Freddie Highmore, Keri Russell, Jonathan Rhys Meyers, Terrence Howard, Robin Williams, William Sadler, Marian Seldes, Mykelti Williamson, Leon G. Thomas III, Alex O’ Loughlin. If you are a reader of reviews by the more ‘serious’ critics, you will find a rather universal dismissal of this film as far too emotional and sentimental. If you are a reader of reviews which try to communicate with the general audience, you will find the film praised for its entertainment and values – and the admission that it is unashamedly emotional and full of sentiment. It was W. Somerset Maugham who remarked that sentimentality is only the sentiment you disapprove of. 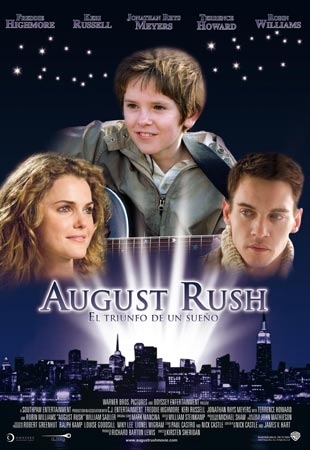 I very much liked August Rush – and it was very tear-inducing, especially because of its joy and happiness. This is a modern fairytale full of coincidences of plot that would have made Dickens both tearful and pleased. It is also a film about sound and music. The writer, director, musical director and composer, sound engineer have all been at great pains to alert audiences to the myriad sounds around us, even the clanging and shrill blasts of the inner city. They are all part of nature’s and human enterprises’ contribution to potential music. Evan Taylor is a young orphan, bullied at the orphanage, especially because he claims to hear his parents. His are the ears through which we listen to the world’s and the universe’s music. We then learn who his parents were, their individual stories (both musicians, he modern, she classical), their briefest of encounters, the forces that pulled them apart, their not knowing they had a son. Jonathan Rhys Meyers takes a break from villains and Henry VIII to play Louis, the Irish father. Keri Russell, who was so good in Waitress, is the American cellist mother. The good news is that Freddie Highmore is Evan. After Finding Neverland, Charlie and the Chocolate Factory, A Good Year, we know that he is a talented and pleasing screen personality. He runs away from the orphanage to find his parents hoping that the social worker, Terrence Howard, will help. I don’t know if I have made this sound like a modern Oliver Twist, but it is, especially when Evan befriends a young street musician and The Wiz, the partly humorous, partly sinister man who takes care of the group of boys and the money they get from busking. He is played with some glee and some frightening intensity by Robin Williams. The Wiz wants to be his manager and exploit him with the name, August Rush. The rest of the story concerns Evan’s encountering an African American church which recognizes his musical genius. He studies, composes and, like Oliver, falls into the hands of The Wiz who becomes more and more like Bill Sykes. And there is an ending, full of music, which will have all but the most hardened sensibilities (the critics!!) reaching for tissues. Kirsten Sheridan wrote In America (full of sentiment also). She is the daughter of Jim Sheridan (The Field, My Left Foot). 1.The audience intended for the film? Popular audience? Children, adults, family? Critics and the condemnation of the sentiment and coincidences? 2.The tradition of the films about search for parents, links, connections? 3.The settings, the orphanage, the city of New York, streets, Washington Square, the old theatre, Juilliard School, Lincoln Centre, Central Park? The backgrounds of San Francisco and Chicago? 4.The parallels with Oliver Twist, the parents, their loss, the boy as an orphan, the Wiz and the children, Arthur as the Artful Dodger, the Wiz as Fagin – and Bill Sykes? The search, Richard Jeffries and the lawyer’s help? Parents, finding their boy, the happy ending? 5.The introduction to Evan Taylor, the voice-over, his age, his qualities, at the orphanage, bullied, his friend, his contacts with his parents, listening? His comments about universal connections? The interview with Richard Jeffries? The cosmic aspects, listening, sounds, rhythms? 6.The importance of music and sound, the sound engineering of the film, the audience sharing the impressions of Evan? The music for Evan, for Louis, for Lyla? Louis and his songs, composing, playing? Lyla and the classics? The two harmonising? Music for Arthur? For the Wiz, for the children? Evan, the discovery of the church, the choir, the piano and his composing, playing the organ, going to the Juilliard School, his composing the concerto, conducting? Incorporating all the sounds into his concerto? Louis’ new song, Lyla playing the piece at the concert? Audience sharing the love for music? 7.Louis and his band, his relationship with his brother, dissatisfied, on the roof, encountering Lyla, the photo, their talk, sharing, points of view, the sexual encounter? The plan to meet, the separation and Louis watching? 8.Louis, the ten years, the business in San Francisco, meeting his friend, reconciling with his brother, the decision, the composing of the song, playing, going to Chicago searching for Lyla, hearing that she was on her honeymoon, going to New York, the meetings, the bargaining for playing at the gig, encountering Evan, playing the guitar with him, not believing him about August Rush, in the taxi, hearing the music, seeing the notice, going to Evan, seeing Lyla, the end? 9.Lyla, playing the cello, her dominant father, going to party, going to the roof, with Louis, the pregnancy, giving birth, the child taken away, her not being told? The ten years, teaching children, Chicago? Boarding with her friend? Her father, his dying, telling the truth? Her going to the agencies, encountering Jeffries? Her plans? 10.Evan, his leaving the orphanage, managing, the man giving him the money, wanting to see Richard Jeffries, leaving, encountering Arthur, the music, giving him the money, the pizza? Going to the theatre, meeting the Wiz? Talking, playing? The Wiz caring for him? Arthur put aside? The clashes, his escaping, going to Juilliard, being transformed, the compositions? 11.The kids, Arthur, playing, in the street, busking, Arthur’s jealousy? Letting the police know, the raid on the theatre, helping Evan escape? 12.Robin Williams as the Wiz, the Fagin figure, his hold over the children, his appearance, his back-story, wheeling and dealing as an agent, pursuing Evan, changing his name to August Rush, the raid, Evan’s escape, finding him, claiming to be his father, putting him back on the street? 13.Richard Jeffries, his back-story, the interview at the orphanage, helping, the posters, the realisation who August Rush was? The encounters with Lyla? 14.The Juilliard board, the interview, the planning of the concert? Evan and his being on the street, Arthur helping him to go, his arrival, conducting the piece? Incorporating the sounds? A credible portrait of a boy genius, his hearing sounds, composing music? 15.The glimpses of each of the central characters at the end – and leaving this happy ending for the audience? 16.Themes of love, family, talent and music?